2017 marks 100 years since the Third Battle of Ypres, one of the bloodiest campaigns of the First World War. According to Adam Hochschild, author of the book “To End All Wars” over 9 million soldiers and around 12 million civilians lost their lives during the First World War. The campaign ran until November 10th 1917 when the British declared victory. Many nations this year are paying their respects in commemoration of 100 years since the Third Battle of Ypres. 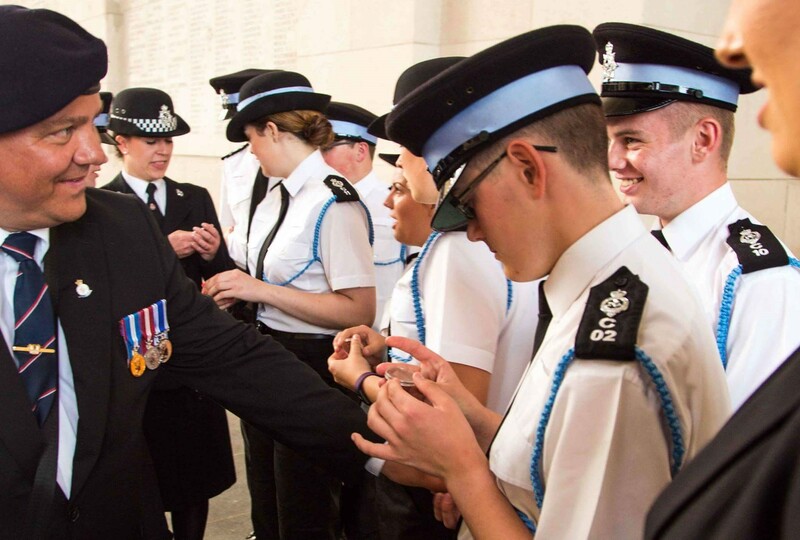 “I, along with other leaders, recently visited Belgium and France with members of the Isle of Man Police Youth Scheme, where, over 9 days we visited several WW1 cemeteries and battle sites. On Monday 14th August 2017, we were extremely proud to be on parade at the Menin Gate, Ypres, Belgium for the Last Post Ceremony. 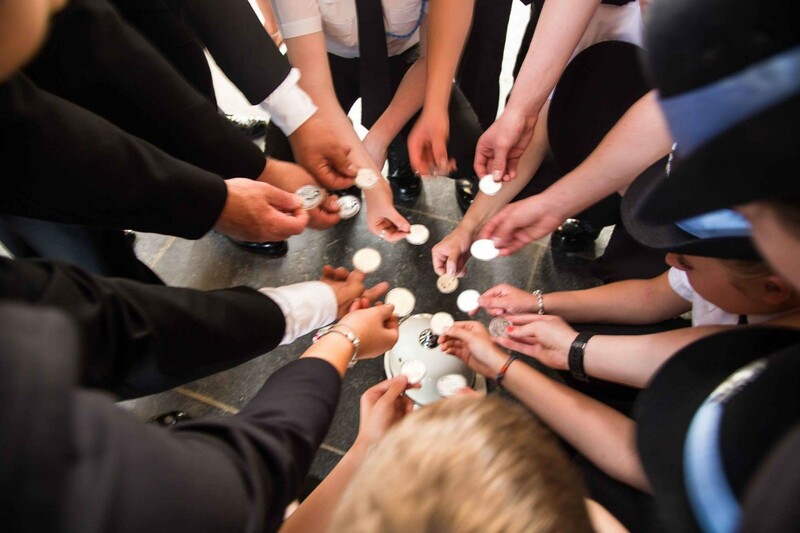 As well as the IOM Police Youth Scheme, the Leaders involved represented the Isle of Man Constabulary and the Isle of Man Branch of the Royal Naval Association. A wreath was laid during the ceremony. Also on parade was one of the organisers of our trip and our tour guide/host who is a serving Police Officer with the British Transport Police. There was around 100 years of Policing experience on parade! Following the ceremony, I presented each of the Youth Scheme and Leaders with a Battle of Ypres commemorative crown which had been kindly donated by The London Mint Office. This will serve as a permanent reminder of this memorable occasion. 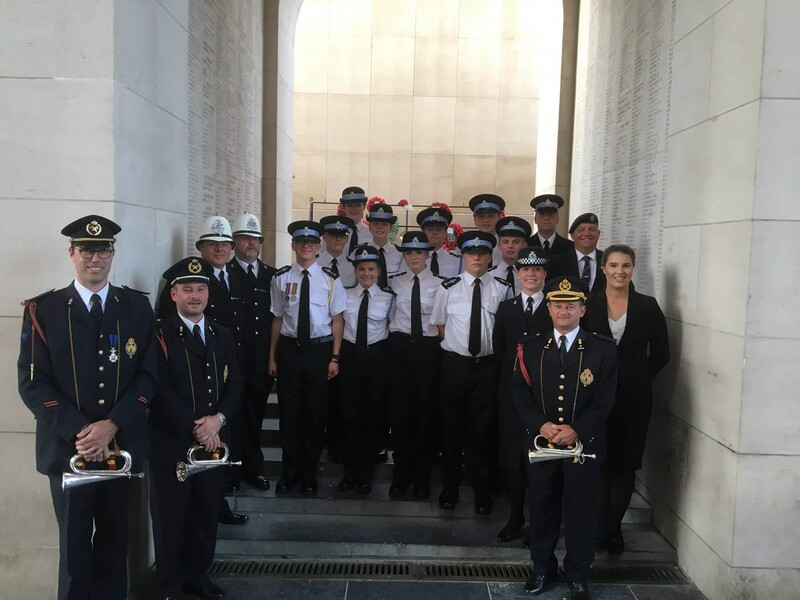 We were also lucky enough to have a photograph taken with the buglers from Ypres Fire service, who carry out the daily service. During our trip, we visited several cemeteries and the young people read eulogies that they had prepared to commemorate Manx soldiers that they had been researching. Many of them had visited relatives of those buried, who still lived on the Isle of Man and 2 of the team were able to visit the graves of distant relatives, which added to the importance of their visit. Most evenings they also read extracts from the book ‘Some Desperate Glory’, the diary of a young Officer in the British Army, Edwin Campion Vaughan, who had been involved in the battle of Passchendaele, around Ypres during July and August 1917, our visit coinciding with the centenary of this action. We were able to visit towns and places mentioned which added an aspect of reality to the diary and also gave us all a valuable connection to the past. We also visited sites on The Somme, one of these being the Thiepval Memorial to the Missing of the Somme. One of those listed was J. Watterson, a former IOM Police Cadet. 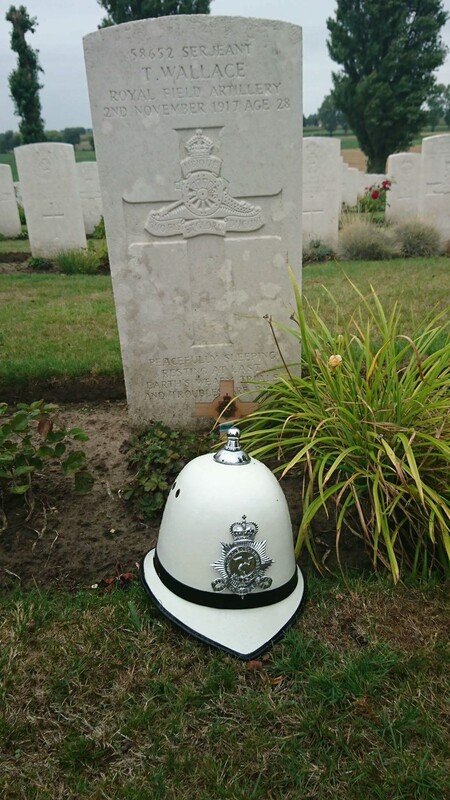 A Manx Police helmet was photographed at the Memorial. Two other former Manx Police Officers graves were also visited in the area surrounding Ypres. It wasn’t all battle sites and cemeteries though as we managed to take in the Bellewaerde Theme Park near Ypres and Plopsaqua Water Park at De Panne to allow for some relaxation after what were some very emotional and exhausting days. The trip also formed the residential aspect of their Duke of Edinburgh Gold Award and they spent time decorating the Scouts Ieper accommodation that we were staying in, as their community project.